A sculpture of the architect James 'Athenian' Stuart -- now a minor celebrity because of his publication of The Antiquities of Athens (1763) -- it was not listed in the 1767 catalog or Algernon Graves' catalog of the organization's exhibitors. 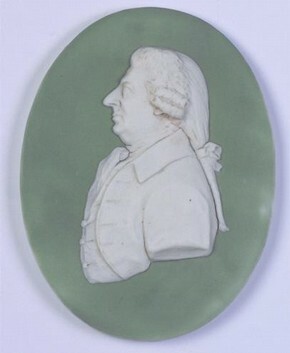 Nor is the bust mentioned in biographies of James Stuart. It was an unfortunate event, both for Moore and Stuart. And, only a few images of Stuart survive, including his self-portraits in gouache (RIBA) and in Antiquities of Athens. Additionally, we have a few images of him at the height of his fame. WC Edwards after Richard Brettingham. James 'Athenian' Stuart. engraving. Victoria and Albert Museum. Perhaps the most interesting image was by William Hogarth in his Five Orders of Perriwigs, a print that still awaits a sustained analysis that builds on Ronald Paulson's insights. William Hogarth. The Five Orders of Perriwigs. 1761. etching. 297 x 221 mm. British Museum of Prints and Drawings. A catalogue of the pictures, sculptures, designs in architecture, models, drawings, prints, &c. exhibited at the great room in Spring-Garden (London, 1767), title page. St. James's Chronicle or the British Evening Post, no. 963 (2-5 May 1767).